Never have the general political discussion at the U.N. General Assembly been more tense and the negotiations on the margins of the world’s most representative forum more intense than this year—because of Syria. Russian Foreign Minister Sergei Lavrov held 55 bilateral meetings with his counterparts, as well as with heads of state and government, in the space of four days. He met three times with U.S. Secretary of State John Kerry alone. This was not all in vain. The U.N. Security Council gathered for an emergency closed-doors meeting Thursday night, Sept. 26, to discuss a resolution on eliminating Syrian chemical weapons. 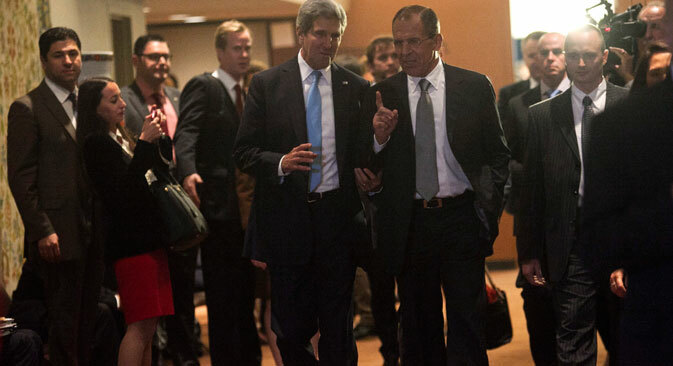 This became possible after yet another Lavrov-Kerry meeting was held to find a way out of the Syrian crisis. After emerging from the unscheduled talks with his U.S. counterpart, Lavrov found five minutes in his busy schedule to share the long-awaited news with Russian journalists first, and also to dot the i’s and cut through the many rumors that are swirling around the draft resolution. According to Lavrov, Russia and the United States had fully agreed on two documents: a draft resolution of the Organization for the Prohibition of Chemical Weapons in The Hague that places Syria’s toxic substance supplies under international control, and a concurrent U.N. Security Council draft resolution. Obviously, journalists were keen to know if the resolution contained references to U.N. Charter Chapter 7, allowing use of force and imposition of sanctions. “The resolution to be proposed to the other UNSC members follows strictly the logic of the Geneva agreements within the framework of liquidation of chemical weapons in Syria. It does not envisage any action under Chapter 7 of the U.N. Charter,” said Lavrov. The U.N. Security Council resolution lists Syria’s obligations as a signatory to the Chemical Weapons Convention. If the Syrian government or the opposition breaches the agreements, the U.N. Security Council will look into the matter specifically. This means a separate UNSC resolution would be needed to authorize any military action against Syria. Moreover, any violations by Syria must be proven by 100 percent, Lavrov explained. In turn, Kerry called the document “a historic breakthrough,” although, in remarks after the P-5+1 Ministerial on Iran, he added that the UNSC would still have to work on the wording. “We did reach agreement with respect to the resolution. We’re now doing the final work of pulling that language together,” Kerry said. Two hours later, the UNSC members gathered for an emergency meeting. Simultaneously, an OPCW Executive Council meeting at The Hague was discussing a concurrent resolution on control over Syrian chemical weapons. Russia’s ambassador to the U.N., Vitaly Churkin, explained that the U.N. Security Council might vote as early as Sept. 27, provided there was a decision by the OPCW Executive Council. It looks like Russia and the United States have managed to shed their Cold War-style, mutually negative stereotypes and suspicions, as far as Syria is concerned. If they manage to achieve destruction of chemical weapons in Syria and bring the government and the rebels to the negotiating table in Geneva, this would lay serious foundations for a joint search for mutually acceptable solutions to other acute global problems.